I’ve heard it said that at some point, we eventually become carbon copies of our parents. The other day at Trader Joe’s, the items in my cart totally made me think I’m becoming my mother, whom I admire tremendously. I’m not sure if it was the organic carrots or the raw almonds, but it’s definitely happening. One of our chores growing up was helping my mom can the summer’s fresh bounty, and recently I’ve enjoyed making chutneys, pickles, and other treats for my pantry. 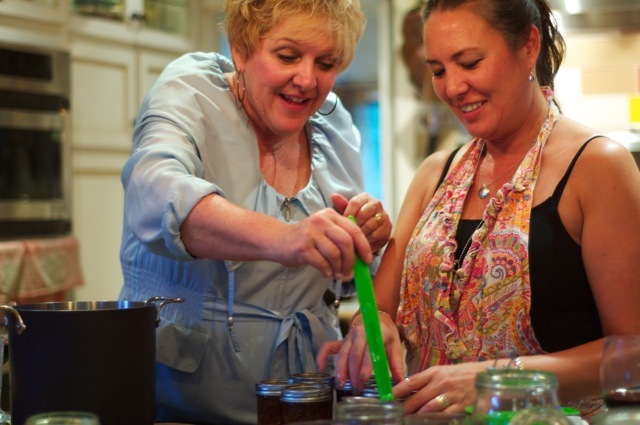 Last Sunday I had my very first canning party … it was so much fun, I can’t wait until the next one! 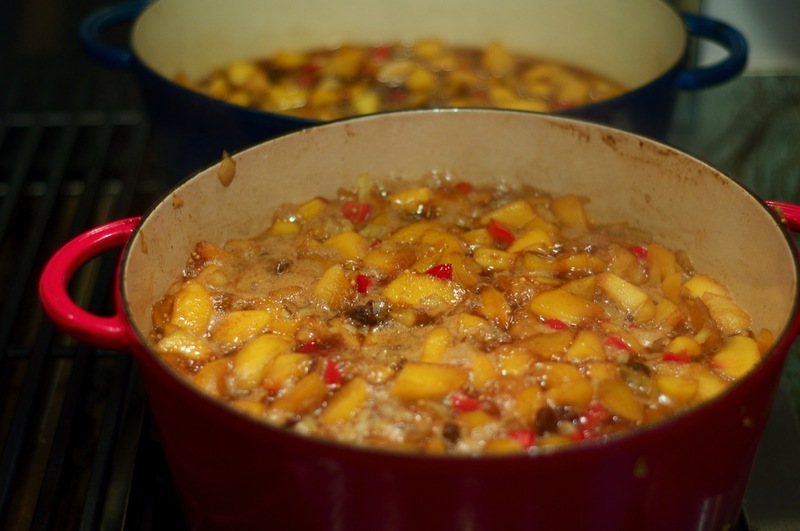 Chris, my Canadian buddy, inspired this recipe selection of Peach and Raisin Chutney. She is an excellent cook, so I was thrilled that she came out for the party. We found this recipe on the Canadian Living website, and it is amazingly delicious. The chutney will make cold meat sing! Also, spoon on top of goat cheese crostinis, brie, pork tenderloin, pancakes, breakfast crepe, french toast, or even ice cream. Fill hot 1-cup canning jars, leaving 1/2-inch headspace. Remove any air bubbles. With Thanksgiving just around the corner, I thought it’d be fun to make a pear chutney, as well … this girl’s just gotta have some chutney on hand for turkey leftovers. 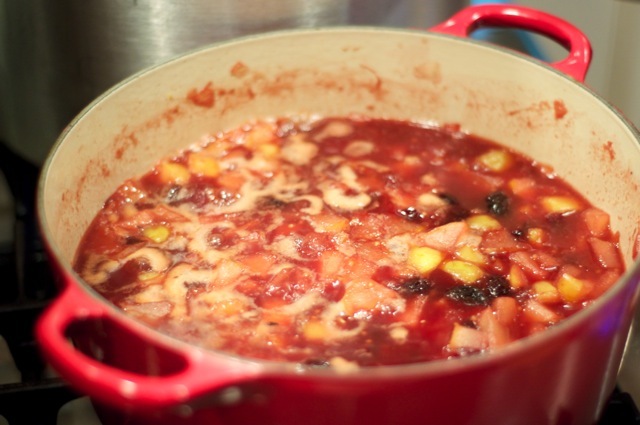 One of the blogs I follow, Food In Jars, had this excellent recipe for Bartlett Pear Chutney with Dried Cherries and Ginger. Place dried cherries in a heat-proof bowl or measuring cup and pour boiling water over top. Set aside. Heat a large, non-reactive pot or skillet over medium heat. Add oil and heat until it shimmers. Add onion and sea salt and cook until the onion softened and develops a bit of color. Add ginger, mustard seeds and cardamom and cook until spices are fragrant and the mustard seeds begin to pop. Add vinegar and brand to pan and use a wooden spoon to work up any bits of fond on the bottom of the pan. Add dried cherries and their liquid. Add chopped pears and sugar and stir to combine. Reduce heat to low, put a lid on the pan and let pears simmer gently for 30-35 minutes so that they soften. When the pears can be crushed with the back of a wooden spoon, remove the lid from the pot. Increase the heat to high and cook quickly, stirring regularly, to help reduce any remaining liquid. When chutney is no longer at all watery and looks deeply colored, take a taste. Should it need it, add a splash more vinegar, a pinch more salt or a spoonful more sugar. Do make sure to taste for adjustments before canning, as ingredients can vary from kitchen to kitchen and it’s the only way to ensure that you’ll wind up with a product that you like. When chutney is fully cooked down and tastes good to you, ladle it into three prepared half pint jars. Wipe rims, apply lids and process in a boiling water bath for 15 minutes. 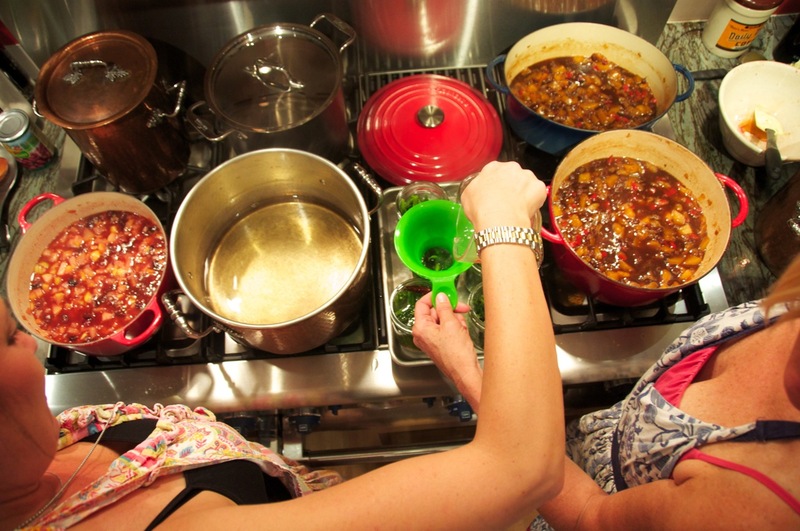 When time is up, remove jars from canning pot and let them cool on a folded kitchen towel. Any unsealed jars should be refrigerated and eaten within a week. Sealed jars can be kept in the pantry for up to one year.